Last week the snow in the front yard was retreating and bits of green grass could be seen near the house, but a weekend storm coated the yard yet again. Winter is not ready to relax its grip. 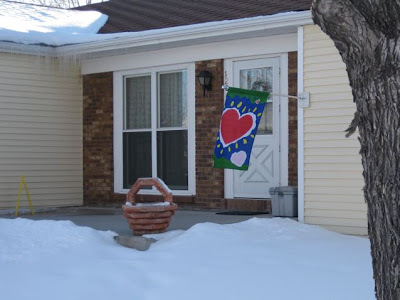 My Valentine flag is the only hint of color in the neighborhood and seeing it makes me smile. Note the icicles in the corner of the house and garage, an area that doesn't get much sun in the winter. The gutter is filled and frozen, so the only place for snow melting on the roof is down - gravity at work. One of my chores is keeping the ice floe from becoming dangerous, so I frequently sprinkle de-icer and keep the caution sign nearby to warn visitors. Hopefully, it will not be necessary much longer. 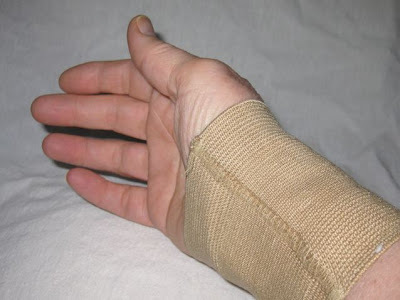 My Olympic knitting has ceased: I've been benched by a wrist that started aching on Saturday evening and not even a supportive wrap helped much. It was hard to put the needles away for a while. I wonder if it was caused by knitting with straight needles after knitting exclusively with circular ones. My knitting binge resulted in nine bibs and six washcloths. I couldn't resist making red, white, and blue bibs while watching the Olympics. Don't you love the plaid-like color arrangement, created by the variegated yarn. 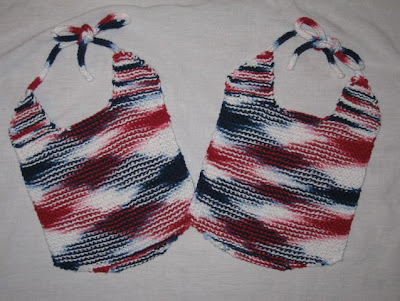 One 4-ounce ball of Lion Brand Kitchen Cotton (Americana) was just enough to make these two bibs. The pattern link can be found here. Kudos to the designers of the Team USA Olympic clothing. Thankfully, the wild and tacky designs of years past are gone, hopefully, for good. Nemo, another Oddball blanket, arrived late yesterday, and I added my section while watching the Olympics - Men's Figure Skating. Before I could begin, I put the needle in a boiling water bath. 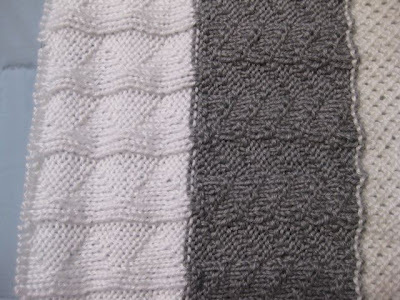 The cable was incredibly twisted and deformed: it is a wonder that any of the previous knitters were able to knit with it. 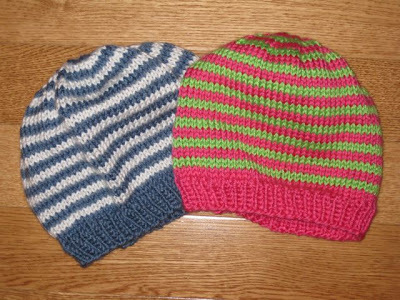 This year, the Yahoo Group, All Crafts for Charity, monthly projects include knitting for babies. While watching the Olympics, I'm knitting bibs and matching washcloths with this yarn. The bib pattern, by Elaine Fitzpatrick can be found here. If you prefer a printer-friendly version, you can find it here. The bib is very simple to knit and is large enough to provide adequate coverage for infants and toddlers. 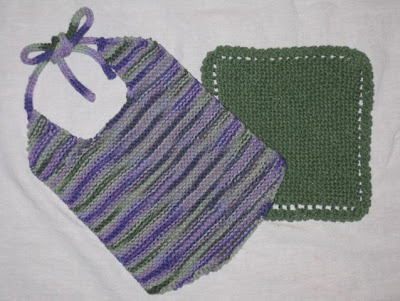 You can find some holiday specific bibs and washcloths on Elaine's blog. Check for the links in the right-hand column. Once I knit the gusset, I can cruise and finish a pair of socks in little time. The cuff is the slowest part for me to knit because of the ribbing. Pictured on two different size blockers (small and medium), they are really an adult medium. It is time to focus on another project since have completed five vests, one pair of mittens, and three pairs of socks for the afghans for Afghans Youth Campaign. 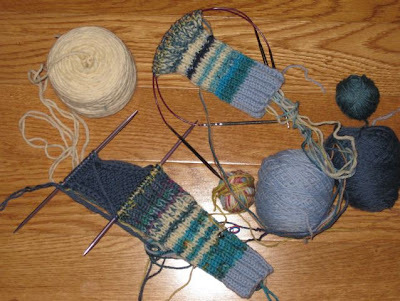 When I have a deadline for knitting socks, I often knit on both socks. For this pair, I knit one cuff and changed yarn for the heel and started the other cuff. 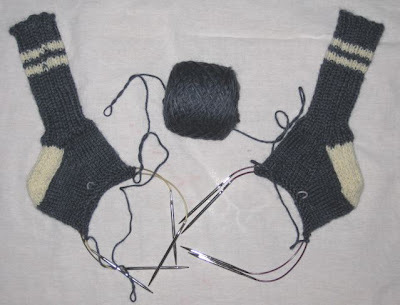 Once the heels were turned, one sock was knit from the center of the yarn cake and one from the outside. Knitting this way helps me keep motivated and also allows me to knit nearly identical twin socks. 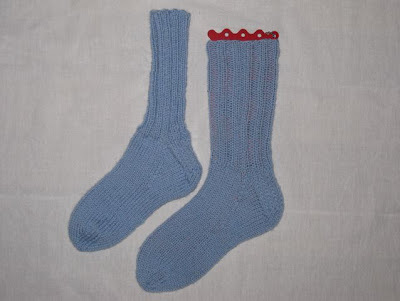 The socks are being knit with Lambs Pride Superwash (Riff Blue) worsted wool on size 5 needles. The winter white is an oddball from my scrap bag. I purchased the Lambs Pride several years ago from a small yarn shop that was selling my rugs on consignment. 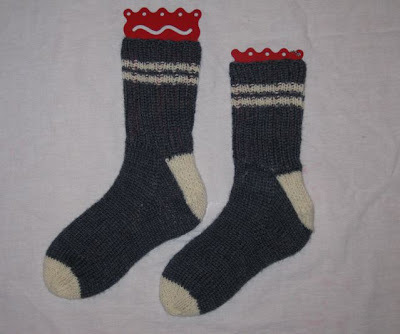 I'll be sending three pair of socks to San Francisco next week to the afghans for Afghans collection center. These socks for afghans for Afghans youth campaign will contain everything but the kitchen sink! I realize they are not the most attractive socks (I used oddballs of scrap sock yarn), but they will keep a child's feet warm. 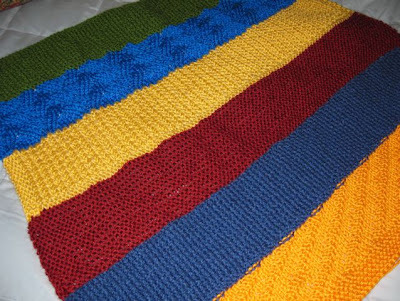 I continue knitting for the afghans for Afghans youth campaign. 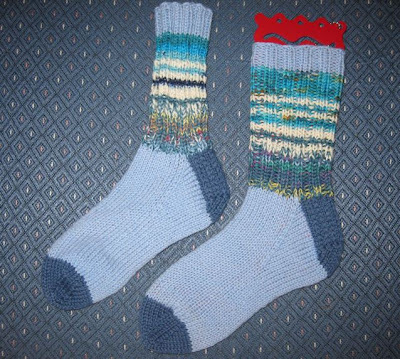 This pair of socks was knit with some sport-weight wool in my stash. I'm sure it was a thrift shop purchase a couple of years ago. A local quilt guild hosted a quilt show on Saturday and Sunday, and I could not resist attending since it was housed less than a mile from my home. A friend and I walked to the show. The block at the top of this post was one of three on a table runner. I spent a lot of time looking at it to determine how it was pieced. 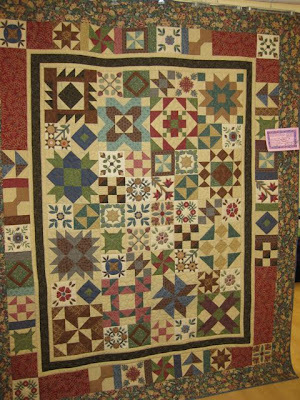 I was impressed with the number and variety of quilts on display. Obviously, this area is blessed with some talented quilters. 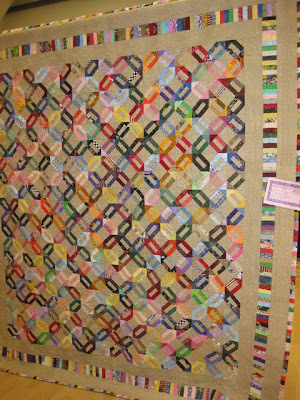 This quilt was made from a local quilt shop's block of the month. I believe three of these quilts were on display. 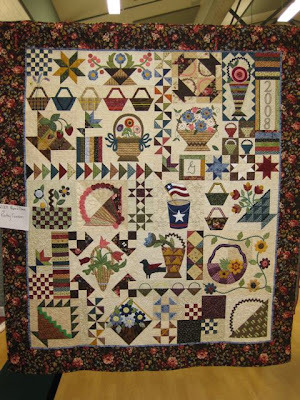 The border of this quilt caught my eye. I especially like the placement of the red strips. 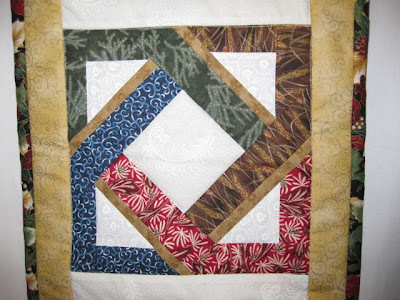 I was intrigued by the block setting on this quilt. 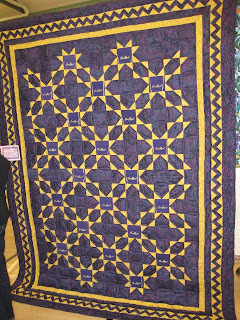 An attractive Crown Royal quilt was also on display. I love the zig-zag border. What a stashbuster! The background fabric almost looked like linen. 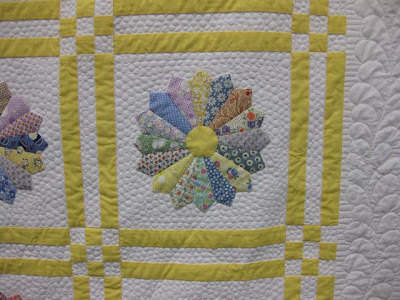 I was impressed with this quilt's attention to detail. 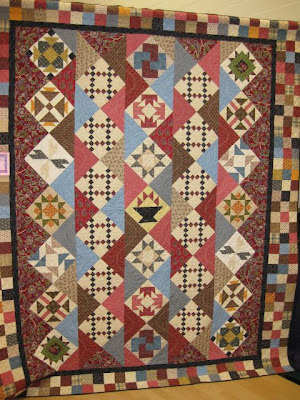 Even the background of the nine-patches was quilted. An awesome quilt. It was difficult to get good photographs because a lot of people were admiring the quilts. The show even had a decent vendor area. Between the vendors, the quilts, and the attendance, I think it is a safe bet this show will be held again next year. This preemie blanket lives up to its name: the morning that Jack Frost arrived was foggy and frost hung on the trees. 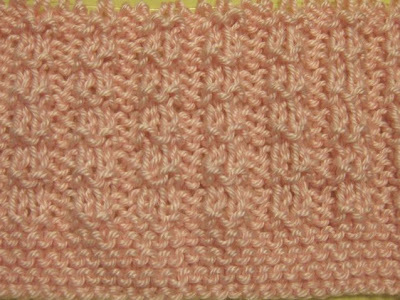 I used Simply Soft (White) and the Triangle Rib stitch for my section. 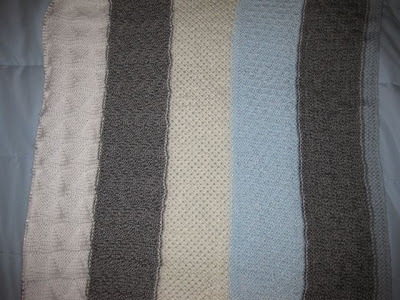 (Sorry, I didn't notice that I had photographed the back of the blanket until I started this post.) 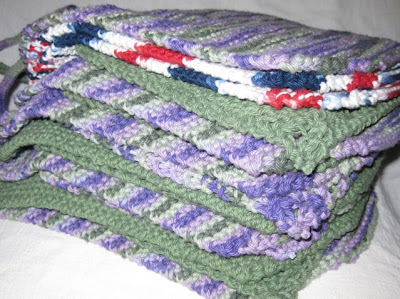 All of the stitch patterns used are reversible and simply beautiful. I started this Oddball blanket, named Bubblegum, on School Days' empty needles. It is ready to begin its travels. School Days, school days, good old Golden Rule days. This old tune drifted through my head as I knit on this Oddball baby blanket, named School Days. 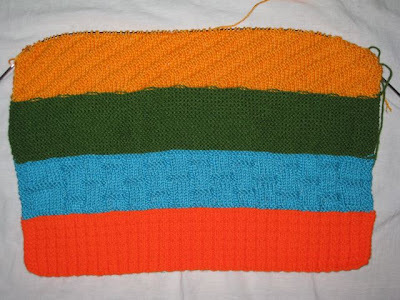 I knit my orange (Simply Soft, Mango) section in same pattern as I did for Green Acres. It isn't often that I am the last knitter, and I enjoyed completing this little wonder. Now, it will be sent to a person who will add a border. Monday night I finished a fifth vest of the afghans for Afghans youth campaign. 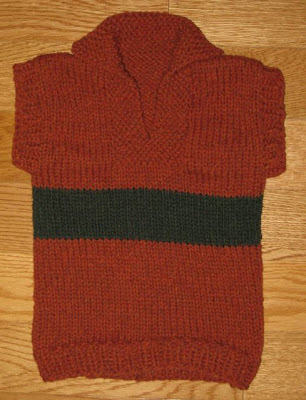 This one is smaller than the other four vests because I thought I would not have enough yarn for the larger size. I wish had knit them, but they were a gift from one of my knitting pals. She needed some yarn for a friend's gift, and since this area does not a lot of options for yarn, I told her choose some from my stash. When she offered to pay me for the alpaca yarn I refused but told her if she had enough remaining to make me something. 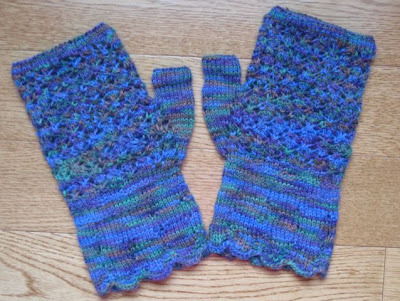 She surprised me this week with the mitts, made from a pattern that I dearly love. Marilyn requested a hat for one of her friends who was recently diagnosed with breast cancer and will be starting chemotherapy soon. I listed the color choices in my yarn bin, and she selected Simply Soft, Country Blue. As I was knitting the hat, I thought it looked too masculine, so I added white stripes to soften it a bit. Then just for fun, I knit a hot pink (Watermelon, Simply Soft) and a lime green (Limelight, Simply Soft). Marilyn's friend can wear whatever hat matches her feelings for the day - serious or fun.